A good vintage year, that’s what they say when a particular year of harvesting grapes produced many a good & potentially classic wine. I would almost say that 2017 could be called a good vintage year in tarot terms, with a lot of excellent decks seeing the light. 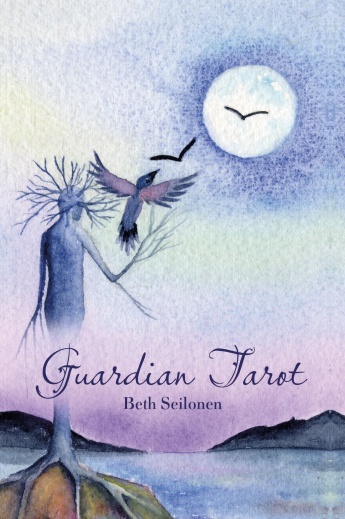 No deck as marked however as Beth Seilonen’s Guardian Tarot. And if marked should get the connotation of striking and outstanding too, I leave up to you. It is surely a deck you’ll look twice at if you have it in your hands. 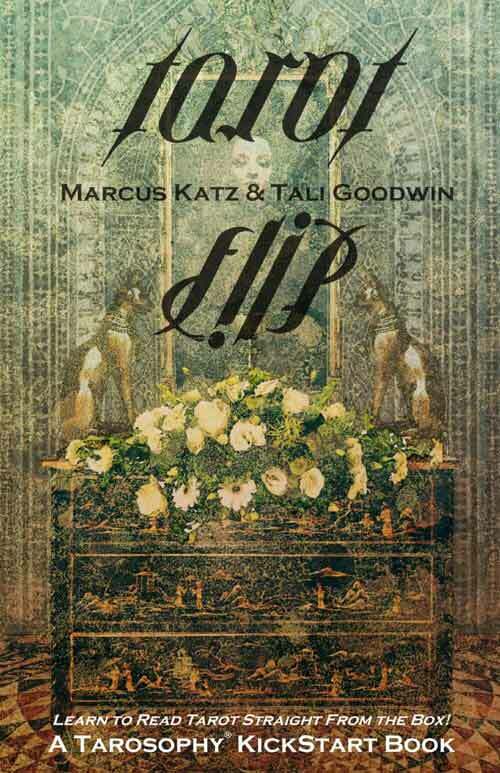 The Guardian Tarot was an Autumn release by Schiffer Books’ Red Feather department. The Mind/Body/Spirit branch of the U.S.publisher had a lot of wonderful releases last year and much to my surprise Seilonens tarot deck was not mentioned in any of the FB groups I frequent. I will be the first to say that it most likely won’t attract a large audience, it is too specific for that, but I did expect a vocal audience nonetheless. Luckily I got a whole box of “Would you care to review these too?” and this deck was in it. I guess it is up to me to give it a voice then. As all Red Feather tarots this one was delivered in a kit with magnetic lid and paperback companion. 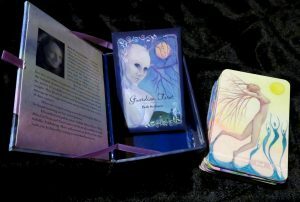 Guardian Tarot is one of the mini-kits. Its little guide is a small (barely card-size), full colour booklet with pretty pastels and cursive fonts for the headings. Each card gets a mini example with one paragraph of intro on the art, one paragraph with meanings and one sentence with possible Rx meanings (the deck is particularly made for readers who do reversals). If you don’t read reversals these sentences won’t be a disappointment to you either since the possible interpretations aren’t just opposites, but they offer a new way of looking at cards. Sometimes that means a nice take on a shadow side upright readers might not have thought of before. The Guardian Tarot comes in pretty decent stock with a little gloss and lamination and nice, large rounded corners. The cards are slightly wider than an average deck, though not an uncommon width either. Besides, this seems to be the standard deck size I see lately in the mini-kits (small-handed readers will have quite the challenge with shuffling, but with this thickness and size I simply recommend an overhand shuffle and you’re golden). The stock can hold up to a riffle too. Guardian Tarot is a deck that hardly follows a known pattern and art. A few of the majors, like Emperor/High Priestess/Death here, will be quite easy to recognise if you have some knowledge of tarot already. The sole reason why I mentioned it is a marked and possibly striking release and I had expected to at least get a few shout outs on the Guardian Tarot is because – as always – of its art. Simply put: it is fascinating and I have never seen anything quite like it. Seilonen chose wonderful watercolors, but exactly *what* she depicted gives room for interpretation. If I were to use a simple term I’d use ‘tree people’. Every card in the Guardian Tarot shows a pale, androgynous and eyeless puppet with branches coming from their hands and heads. I have to be honest: my very first thought was “creepy” and at first sight this definitely would not be a deck I’d choose to do what the artists wants me to ascertain with this deck, which is connecting us nature and nourishing ourselves again by bringing the two entities together. I looked at all 78 paintings and creepy was all I could see – at first. I wasn’t the only one, because when showing the deck in a test reading on Instagram this word popped up more than once. Two of my favourite majors in Guardian Tarot and the card I would probably never have recognised as The Devil. So, I did what I always do when I want to know more about a deck: I researched and found Seilonen’s own WordPress site. Much to my surprise I saw her using the same word I used above: Tree people. Being worried about pollution and the destruction of the earth the tree people entered her drawings first. She created several paintings using a barren birch tree with gnarled limbs to convey that humans are doing wrong. When she evolved in her thinking her paintings did to. Her tree people became spiritual beings and softened. They reached for the moon, they were pregnant, they had wonder in their hearts like little children dancing in the forest for the first time. When I saw her explanation I think I felt her deck. 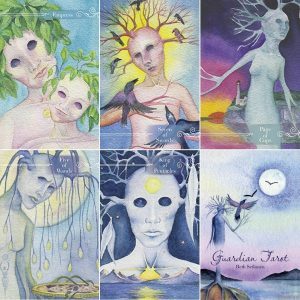 The Guardian Tarot IS the tree people, it IS her connection to nature and what she hopes for human kind to reach for. But her worries could never be entirely swiped away and they steeple through. Like a canvas repainted but perhaps showing parts of the earlier drawings. It is why at first the Guardian Tarot might seem creepy – its strange puppets with the empty sockets – but once you know which story is behind it and work with it you’ll soon notice a very gentle vibe. And look at the deck differently. It all comes back to nurturing your soul, yourself and choose rest instead of life’s combat. And such an outlook will reflect back in how you handle others and the earth you live on. Actually…I am quite sure that Seilonen’s wish to have this deck create a nourishing attitude had an effect on her artwork. And that resulted in very typical readings. This does not happen all the time. Decks respond to the reader. But in this case, regardless of topic, the overwhelming message in *every* answer always came back to the fact I also had to take care of myself so I wouldn’t deplete my body or soul. That wasn’t creepy, it was eerie. But eerie in a good way. It means this deck can have an interesting purpose if it will work like that for every reader. And it does say something about the strength of her work. In a way it made me think of how a lot of oracles work. It has that oracular vibe. When I wrote this I did not mean to put the Guardian Tarot in the corner of Oracles rather than Tarot. The deck has 78 cards, 22 Majors and 56 minors of which the regular 16 are courts. Plus, the companion and use of tarot titles obviously shows Seilonen herself honoured a tarot structure and wants you to read it as such. No tarot or no WCS? That is not to say several people *will* argue the deck is an oracle rather than a tarot deck. That has to do with the fact this deck has so many deviations from most known tarot decks that #camporacle and #camptarot both have a good argument. The Guardian Tarot is *probably* based on the Waite-Smith. “Well, you’re the reviewer…shouldn’t you be sure? !” Yes, most of the time I am and I am purely basing this on the fact that Strength comes after the Chariot and there are no typical Golden Dawn or Marseille depictions to put me off that path. However…there aren’t any typical WCS/RWS depictions either. What do you get when you decide to buy this quirky tarot that might not be entirely tarot? Well, every card shows a simply title in a classy lined bar – without the THE’s. Meaning you’ll read Fool, Chariot, Tower, instead of The Tower, The Chariot and so on. No numbers are shown on any of the Majors and with the Minors it is mixed in the title. Five of Pentacles, Three of Swords et cetera. Either on the bottom or the top of the card, depending on readability of the text. That is where any link to the WCS stops. Art-wise there is nothing suggesting the deck was based on one of the 3 foundational tarot decks. While the minors aren’t simply suit symbols, they evidently aren’t the scenics we know from Waite & Colman-Smith either. The Eight of Swords for example doesn’t have a single sword in the picture. Instead the imagery gives you two guardians – a.k.a tree people – looking in other directions. The smallest one is looking at us and has leaves sprouting from his body. The Six of Wands has one central figure, looking very much like a pretty woman in a short dress with lettuce hair and long branches as hands. Behind her is a blood-red moon and several other floating tree people. Together they make six. Perhaps the red moon tells us wands…but other than that: no. Last example: The Nine of Cups is a large woman’s face with autumnal coloured leaves surrounding her. She’s staring down at a white chapel and some grasslands set against a sunset. Again I need the title to see which card I am seeing. Though this is perhaps one of the few cards where the satisfaction of the card we all know does come across in its new art form. This issue is equally hard with the court cards, but here Beth Seilonen finally introduced something to go on….though bullet-proof my theory is not (if you see something I missed, please tell me in the Facebook comments!). When a deck designer foregoes on regular WCS scenics or pips there is usually a different kind of rule set. For example: the colours give the suits away, the elements get depicted in a certain way, suit symbols get their own very specific imagery, there’s safety in numbers (meaning a 9 of wands shows at least 9 somethings. A 3 of pentacles will show three thingies). Even the extremely abstract Dream Dust Tarot followed this construct. The Guardian Tarot does not, unless you look closely at the court cards. Like I said: it wasn’t followed through in all the cards, but it did give me some form of common denominator. #Swords/Air interacted with birds. Sadly the Queen of Swords did not. Why, I have no idea. #Water and the colour blue is seen a lot in …yep, you guessed it right, the Cups. Again, the Queen is ripped from this common symbol. Interestingly enough she *does* get a cup! The King, blue-ishly portrayed as he might be, is otherwise not recognisable as a King of Cups. He does hold a baby though. Make of it what you will. #Last but not least the Pentacles. I want to say: the flowers! But here we had no consistency either. Knight and King get some extra branches but that’s it. I do think it is a hint towards ‘more earthy stuff’, but it is meagre. The Majors might be the easiest to figure out, even though the Guardian Tarot also shows a completely different pattern and body of art here as well. What does help us here is the fact the order is the same as the Waite-Smith and so are all the titles save 12 (Hanged Man becomes Suspense in the Guardian Tarot). Also, several of the Majors did embody the spirit of its ‘brothers and sisters’ out there a little easier. I could identify them quite fast. Moon, Sun, Star, World, Lovers, Death and Fool were clear at once and after a few test readings and picking up the companion I began to see clues giving away f.e. Justice, Emperor, Chariot and Devil too. There are still a few I simply do not see, even after reading her texts. But I know this is always a matter of objectivity and symbolic knowledge/cultural background as well. What it comes down to is this: Other than the 56+22, Majors/Suits/Courts rule this deck does not really have rules. It is completely up to you to create a connection between the tarot knowledge that you have and the art you see before you. Despite the short texts the guide is the first one to get you there. It will be confusing because your tarot brain will expect something to see in a Five of Pentacles that it won’t get, while the companion will actually hammer that expectation down (sometimes in different words though). Seilonen is all about the tarot message, but you will get it in a different package. And that has its consequences when it comes to reading with the deck. A few extra examples of Guardian Tarot head on. I am not saying this ‘proves’ #CampOracle to be on the right side, but several tests with the deck showed me quite soon that primarily holding on to a tarot construct isn’t the best way to get answers from the depicted Guardians. Once I treated Guardian Tarot as Guardian Oracle (well, the way I read oracles) and purely let the images speak (when I had a bit of ‘seers block’ I added the known information on the title of the card to it)I got clear and strong messages. And here’s the ironic kicker for you: where holding onto “This is the King of Pentacles, or this is Nine of Swords thus should mean…” gave me wooden beginner’s interpretations, letting my eyes wander over shapes, forms, links (basically the techniques used in TdM, Minchiate and abstracter oracles) I came closer to ideas behind tarot cards as we know it. This will tell you two things: 1. Guardian Tarot could be off-putting at first due to the many adaptations and strange tree people (guardians) but its art is strong and symbolic, and certainly has a message to deliver. Don’t rule it out as a divination tool and use your tarot knowledge not as a crutch or foundation but as an additional fountain of wisdom. 2. This is absolutely not a beginners deck if you want to learn basic tarot and use it as a stepping stone to WCS/Thoth/TdM or any of its inspired-by decks. I have to hand it to the artist. This deck is a huge risk. It feels like a genuine project, one coming from the heart. 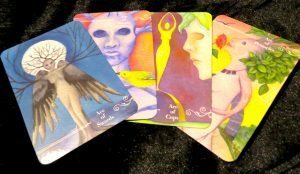 Her personal convictions shine through in this work and reading with it gives you exactly the nurturing vibe she meant to give with Guardian Tarot. Sadly, I am also certain this is exactly the problem for some readers. It does not follow a known pattern, it does not follow often used universal symbolism and it does not even follow a different kind of rule-set that makes you have something to fall back on. That qualifies this deck as especially unique, as a niche and as an adaptation of tarot. Some might call it an oracle because of it. Whatever you think and however you classify it, the cards will each come to life if you give the deck a chance. And they actually give you exactly the interpretations you were looking for (with WCS), but just in a totally unexpected way.